Jack Gibbons brought his 16 year run of annual concerts at London's Queen Elizabeth Hall to a close on Sunday July 10th 2005 with a special celebratory programme. He has plans to return once again to London's premier recital venue in the near future. Award-winning pianist JACK GIBBONS returned to London for the last of his annual Gershwin concerts at the Queen Elizabeth Hall, following sell out performances at New York's Carnegie Hall in February 2005 and at the Queen Elizabeth Hall in July 2004. Gibbons famous Authentic Gershwin concerts have been an eagerly awaited annual event on London's South Bank for over 15 years. 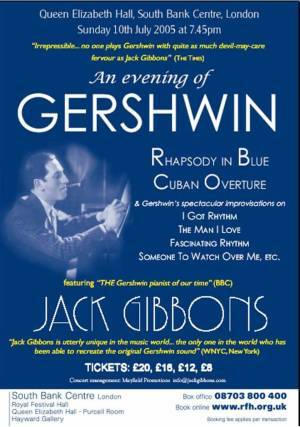 The programme for 2005 included the original version of Rhapsody in Blue and Cuban Overture, plus Gibbons' famous transcriptions of Gershwin's breathtaking original show-tune improvisations painstakingly reconstructed by Gibbons from the composers historic 78 recordings and piano rolls, and unplayed by anyone since the composers own performances in the 1920s and 30s. The concert also included the UK premieres of several of Jack Gibbons own compositions, recently given their World Premieres at New Yorks Carnegie Hall. Gibbons returned to composing after an absence of 25 years during his long recovery from a life-threatening car accident in 2001. For more information on Jack's own music, including audio files, click on this page link. Jack Gibbons is widely regarded as one of the world's finest piano interpreters of Gershwin, being described by the BBC as "THE Gershwin pianist of our time" and by New York's premier classical music station, WNYC, as "utterly unique in the music world". His all Gershwin concerts feature his own unique reconstructions of Gershwin's breathtaking show-tune improvisations, with which the composer dazzled high-society New York party goers in the roaring 20s. His programmes also include immortal Gershwin concert masterpieces such as the Rhapsody in Blue (in Gibbons' own reconstruction from Gershwin's 1925 piano-roll). "Jack Gibbons is able to reproduce Gershwin as Gershwin performed, in a remarkable recreation of Gershwin's unique keyboard style." Jack Gibbons' Gershwin performances at London's Queen Elizabeth Hall have become legendary and have been an eagerly awaited annual event in the South Bank calender. Over the years his programmes have included no less than 48 Gershwin world premieres, painstakingly reconstructed by Gibbons from the composers historic 78 recordings and piano rolls, and unplayed by anyone since the composers own private performances in the 1920s and 30s. In 2001 Gibbons was about to chalk up another milestone of Gershwin performances when his career came to a dramatic halt after he narrowly cheated death in a horrendous automobile accident. After a years recovery Gibbons made a miraculous (Sunday Express) return to a sell-out Queen Elizabeth Hall in July 2002. In 2003 he again played to standing ovations from a totally sold out hall, in a programme that also featured Gershwin readings by the Oscar-winning actor Sir Ben Kingsley. Musical Opinion wrote of the concert: There are few pianists today who can fill the Queen Elizabeth Hall, but Jack Gibbons is certainly one of them. His unique style of playing has lost none of its power and communicative qualities. "Jack Gibbons is utterly unique in the music world. I venture to say that he may be the only one in the world who has been able to recreate the original Gershwin sound. Hearing him play I think to myself this sounds more like Gershwin's old recordings than anything I've heard. It's astonishing." "Gibbons dashes off the most insanely difficult passage-work with a broad grin. This is music that requires verve, nerve, and Gibbons' enviable capacity to generate party atmosphere." "Jack Gibbons is not simply a pianist, he is a magician whose playing brings back to life another era. Gibbons' enthusiasm was evident from the start... his interesting and at times humorous commentary gave the performances a stamp of authority that made the evening memorable." parity with Gershwin the composer"